It’s storytime from Confetti Park! In this episode, we hear the sweet and clever tale of Little Laveau, narrated by the author, Erin Rovin. 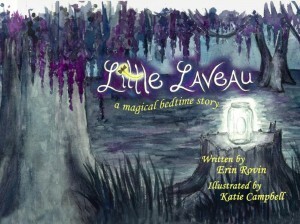 Little Laveau is an enchanting little bedtime story set in the Louisiana bayou. Laveau is a lovable character who draws on her deep family roots and the magical environment for inspiration as she helps friends and animals. In this adventure, Little Laveau’s friend Thomas is having bad dreams, and he doesn’t know what to do. Luckily, Little Laveau has just the cure! The book, available for sale online at the Book Patch, features enchanting and atmospheric watercolors by Katie Campbell. Little Laveau is such a great character, and the idea for how she shares family recipes with her friends and readers is adorable. We cannot wait to see what new adventures are in store for Little Laveau! Thank you so much Erin for sharing your story on Confetti Park.